Offering you a complete choice of products which include flanged thermowell and sceewed type thermo- well. With sincere intentions to preserve and uplift our reputation in the market, we bring forth a distinguished assortment of Flanged Thermowell. Our offered product is designed and manufactured using best-grade raw material and advanced technology in conformity with defined quality norms. 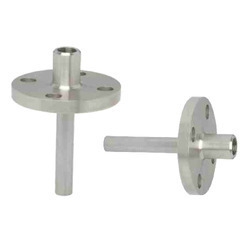 The offered product is extensively used in different industrial applications. Keeping in mind the diverse needs of our clients, we provide the entire range of product in various specifications and at affordable prices.